This is a combination of Calcitriol, elemental Calcium which is derived from Calcium Carbonate (from Oyster shell) and elemental Zinc derived from Zinc Sulphate - which is a perfect synergistic joint- relieving product and helps repair joint damage mostly useful in Osteoporosis and Osteoarthritis. Osteoarthritis is a joint pain inflammation that results from cartilage degeneration and hyperhomocystemia- an independent risk factor for osteoporosis. Calcitriol is a synthetic vitamin D analog which is active in the regulation of the absorption of calcium from the gastrointestinal tract and its utilization in the body. Calcitriol is the active form of vitamin D 3 (cholecalciferol). It is produced in the kidney from the vitamin D metabolite, 25-hydroxyvitamin D3(25(OH) D3 ). Calcium plays a critical role in the body. It is essential for the normal functioning of nerves, cells, muscle and bone. Calcium prevents bone loss and is associated with a modest reduction in fracture risk. Calcium and vitamin D preparations are used to prevent or to treat calcium deficiency. A vitamin D-resistant state may exist in uraemic patients because of the failure of the kidneys to adequately produce calcitriol. Zinc is a nutritional supplement important for normal growth and tissue repair. Urinary elimination of zinc is increased in osteoporotic people. 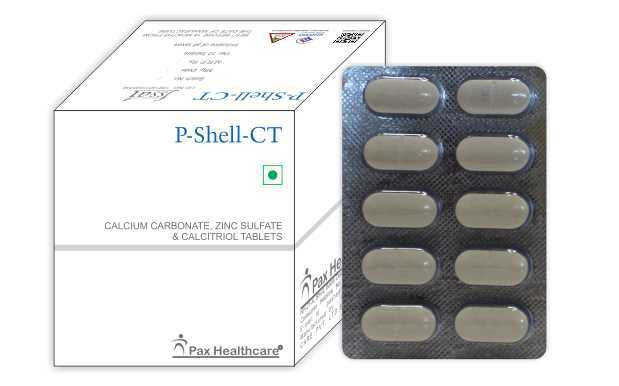 Zinc depletion is shown to diminish the response of oral calcitriol when administered orally. Supplementary zinc not only improves calcitriol response but also helps to arrest bone loss in older postmenopausal women. This is a delicately balanced formula to improve bone and joint health and combating debilitating bone-joint diseases. This supplement is indicated for osteoporosis, hypocalcaemia, osteomalacia and conditions where additional Calcium is required. Calcitriol is a form of vitamin D and it is the active metabolite of Vitamin D.
It is used for established osteoporosis in postmenopausal women, to reduce the risk of vertebral and hip fractures. Osteoporosis is the loss of bone mass resulting in brittle bones which can fracture more easily and is often associated with lack of oestrogen in postmenopausal women. It is also used for induced osteoporosis following treatment with a corticosteroid, an anti-inflammatory steroid that can cause bone loss and to correct defective calcium metabolism, which results in weak bones due to renal osteodystrophy caused by chronic renal failure, particularly when undergoing haemodialysis; hyperparathyroidism (high levels of parathyroid hormone) with moderate to severe chronic renal failure (pre-dialysis), hypoparathyroidism (low high levels of parathyroid hormone) from various causes, and rickets. Calcium is needed for so many different functions in the body it is an essential mineral that provides strength to bones and teeth, but it has several other health benefits. Calcium is essential to nerve conduction, hormone status, blood clotting and muscle contraction. Some research has shown that diets rich in calcium, fruits and vegetables can reduce the risk of high blood pressure. Calcium helps prevent osteoporosis; of the two to three pounds of calcium contained in the human body, 99% is located in the bones and teeth. Zinc is an essential trace mineral found throughout the body, often in conjunction with protein. Zinc is transported in the blood via the protein albumin, so low albumin levels often mean poor absorption of zinc as well. Zinc is a cofactor used to activate dozens of enzymes in every organ in the body. Bones, the prostate gland in men, and the eyes have the highest concentrations of zinc, but about 60% of total zinc in the body is found in muscles. Among many roles of zinc, it supports immune system, helps the body to heal wounds and useful in the growth and maintenance of muscles. Calcitriol stimulates intestinal absorption of Calcium, thus giving supplemental Calcium helps in achieving maximum effect of Calcitriol. It exerts negative feedback control on the parathyroid gland through both direct and indirect mechanisms. It directly inhibits parathyroid hormone (PTH) secretion and indirectly it increases serum calcium which has negative effect on PTH secretion. The known sites of action of calcitriol are the intestine, bones, kidneys and parathyroid gland. In bone, calcitriol in conjunction with the parathyroid hormone stimulates resorption of calcium; in the kidneys, calcitriol increases the tubular reabsorption of calcium. Calcium prevents bone loss in postmenopausal women and is associated with a modest reduction in fracture risk. Zinc is an integral component of many enzymes and is widely distributed in the body; skeletal tissue, andmuscle and soft tissues are rich sources. Zinc has a role in stabilizing macromolecular structure and synthesis. In hypercalcaemia and vitamin D toxicity. Pregnant and lactating mothers should not take any single supplement in higher-than- normal doses unless recommended by a health-care provider for a special condition. Store in a cool, dry and dark place. Protected from direct sunlight.